Another dewy morning meant that the spider webs were highly visible again. There are some huge ones in the area behind the big barn. 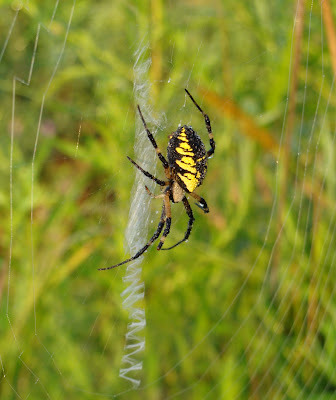 Most seem to be occupied by the striking Yellow garden spider (Argiope aurantia), which are correspondingly large (their bodies are about an inch long). The web has an interesting zig-zag centre part (called a stabilimentum), which doesn't capture prey and which is apparently there to stop birds flying through it (according to the University of Arkansas's Arthropod Museum, anyway). The female spiders also eat their own web every day, before rebuilding it in the same place (seems like a lot of work). *Or itsy bitsy, or teensy weensy, depending on your cultural background. I see maybe one of these in the garden each year. I think . . . the spiders in this group are called 'orb spiders' because of the shape of their webs and that some of them can bite. Now I'm going to hide because there's a good chance I don't know what I am talking about. A beauty, and I hope it has a good appetite. Not for people, though. 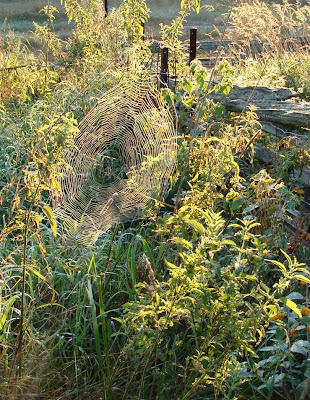 Spider webs are truly amazing things, it's just too bad spiders usually come with them!